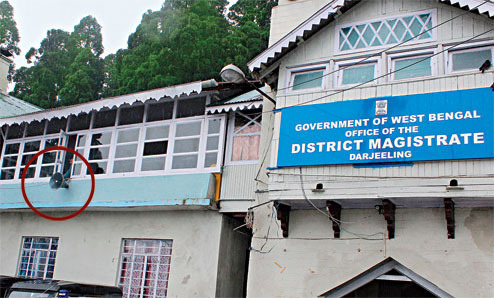 The Darjeeling district administration has extended the ban on Internet in the hills through July 14 and served showcause notices on two service providers for allegedly flouting the communication embargo. Today, a loudhailer was put up at the Darjeeling collectorate today and folk Nepali songs were blared out for nearly four hours. The Darjeeling district magistrate, Joyoshi Das Gupta, said since "there is a lot of sloganeering" outside her office, she thought of playing songs. Internet services have been shut in the hills since June 20 following the launch of the fresh statehood movement. Das Gupta today extended the ban till "the intervening midnight of 14-15 July, 2017". The ban will be in force in Kalimpong district also through July 14. Sources said the administration had issued showcause notices to MTS and Airtel, asking them to say within 48 hours why action should not be initiated against them for failing to comply with the Internet ban. "The showcause notices have been issued as the administration believes the two Internet providers did not completely shut down their services," said a source. A dozen Nepali songs were played out at the DM's office from 10.30am till 2.30pm, loud enough for the neighbourhood to hear them. Although Das Gupta said the music was blared out because of the Gorkhaland sloganeering, no rally was held outside her office today. During the earlier statehood agitation, K.L. Tamta, then inspector-general of police, north Bengal, had joined Vidyarthi Morcha supporters who were raising slogans against him near Salbari in Siliguri. Binay Tamang, the assistant general secretary, however, said the party had taken strong note of the DM's decision to play music through loudspeaker. "Our men have died; they are injured, and many have been arrested. What is she trying to do by playing loud music in her office?" asked Tamang. Morcha president Bimal Gurung said: "Can our hearts be won by playing Nepali songs? We want our identity."